Piso Fare 2019 Promos Until 2020: Traveling from June to September 2014? Here's a NEW promo! Traveling from June to September 2014? Here's a NEW promo! 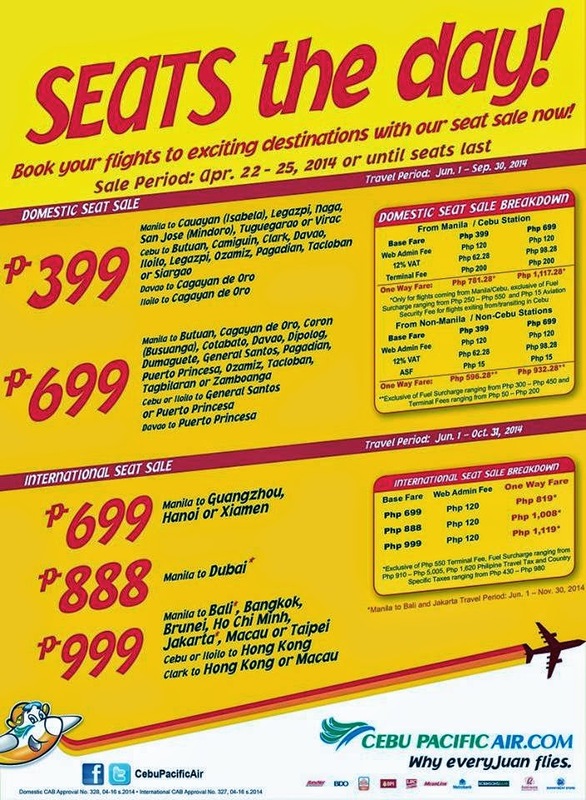 Piso Fare 2015: The Piso fare is over but Cebu Pacific has come up with a new promo offer to you! Both domestic and international flights. Just make sure you check which destinations are on sale! *Only for flights coming from Manila/Cebu, exclusive of Fuel Surcharge ranging from Php 250 – Php 550 and Php 15 Aviation Security Fee for flights exiting from/transiting in Cebu. Quoted DOMESTIC one way fares are inclusive of Base Fare, Php 120 Web Admin Fee, 12% VAT, Php 200 Terminal Fee for flights transiting in or exiting from Manila/Cebu Station and 7 kg hand-carry baggage allowance, but exclusive of Fuel Surcharge ranging from Php 250 – Php 550, Php 15 Aviation Security Fee for flights coming from Cebu and check–in baggage. Terminal Fees ranging fromPhp 50 – Php 200 for flights originating from non-Manila/non-Cebu Stations must be paid at the airport. Quoted INTERNATIONAL one way fares are inclusive of Base Fare, Php 120 Web Admin Fee, and 7 kg hand-carry baggage allowance but exclusive of Php 550 , Php 1,620 Philippines Travel Tax, Fuel Surcharge ranging from Php 910 – Php 5,005, Country Specific Taxes ranging from Php 430 – Php 910 and check-in baggage. Promo fares have limited availability and are non-refundable but rebookable subject to the following rebooking fees: Php 1,200 for Domestic destinations and Php 2,000 for Short-haul International destinations and Php 2,500 for Dubai plus fare difference. For your convenience, flight changes, availing of prepaid baggage allowance for check-in baggage and web check-in service can be done up to 4-hours before scheduled flight. AVAILABLE NUMBER OF SEATS ON-SALE PER ROUTE and v.v. Piso Fare 2015 Is On with Air Asia Zest! PAL Promo Fare 2015 for Mindanao is on! Piso Fare 2015: Latest Summer Sale!